I do love a nice warm sweet cup of tea! I’ve never been a coffee drinker (even though I wish I could like the stuff, because it’s a lot easier to get at. Ever tried to get a hot cup of tea on an airplane? Unless you are going to London, you are pretty much relegated to lukewarm weak tea after all the coffee drinkers are served. Sigh.) 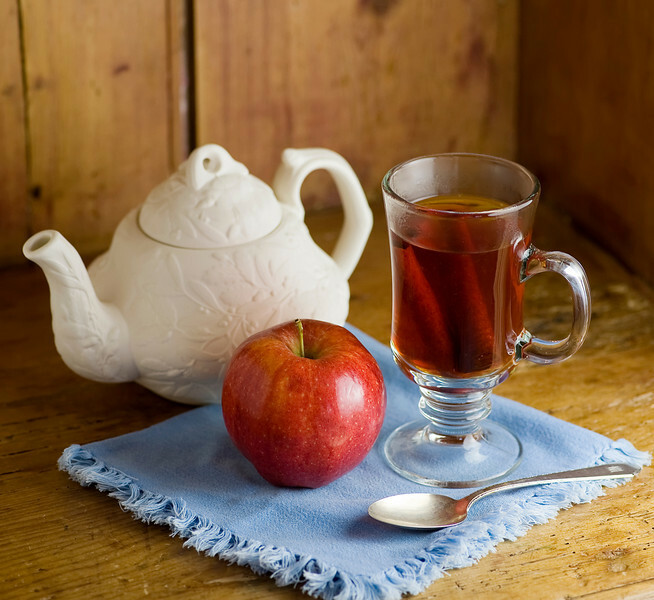 So I am always on the lookout for new and interesting tea recipes, and I’m loving this sweet and soothing apple lemon version that is, as the saying goes, both good and good for you. Here’s one of the more recent reasons why I’ve been enjoying lots of tea lately. The Southern husband and I celebrated our anniversary last month, and for the last several years we’ve been doing a joint anniversary present for each other. 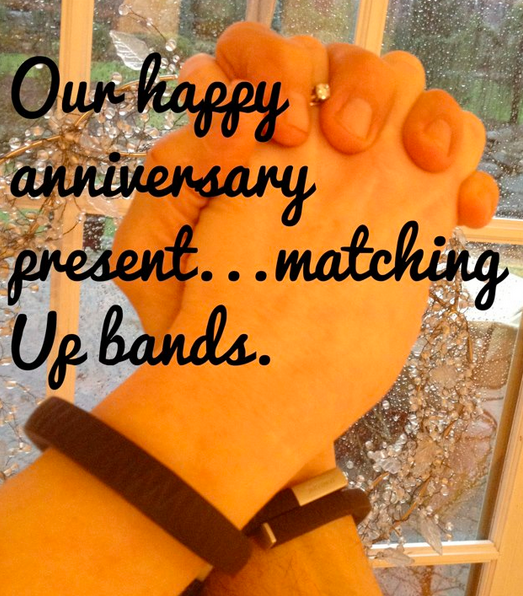 This year we decided to get matching UP bracelets. And let me start by saying the makers of the UP bracelets have never heard of me or my blog…this is my own unvarnished experience with mine. Anyway, the UP is basically a rubber bracelet that tracks your movement and your sleep patterns. It syncs with an app on your Iphone where you can also input everything you are eating by either scanning the barcode or searching their food database. Then it takes all this information and puts it together in one cheerful analysis on your phone. 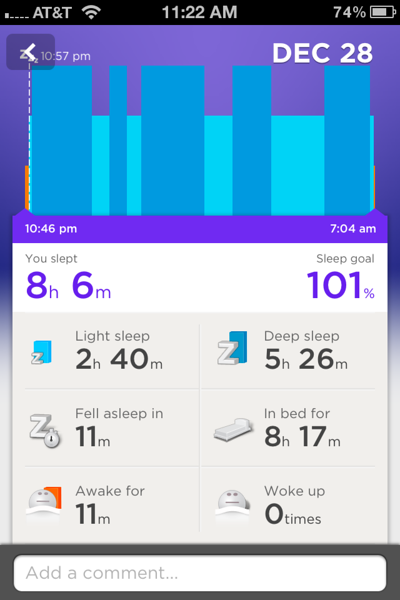 You can see how well you slept (my favorite part – I am extremely good at sleeping). You can see how much you moved. I’m less good at this part. The Southern husband is fabulous at moving, on the other hand. The first morning that we wore them, I checked our movement after being up for an hour. I had moved 96 steps…he had moved 1,513 steps. But she’s more active, so that’s good. But then there is the whole food input thing. You gotta do it if you are going to get the most out of your bracelet, and so I’ve been doing it. And I have to tell you, scanning everything you eat into your phone will make you think twice about having that fourth chocolate chip cookie. And not wanting to scan that cookie into my phone immediately makes me feel like I am STARVING. So I started figuring out what I could ingest lots of that would make it okay if I only walk 96 steps for every 1,513 that the Southern husband walks, and that still satisfies my sweet tooth. Hello, sweet and delicious apple lemon tea. I love you. You make it by boiling up water, apple juice, cloves, allspice and lemon juice, and then you use that instead of water to steep a bunch of English breakfast tea (or good old Lipton will work just fine too.) Once the tea is brewed, pour it through a strainer to collect all the solids and there you have it – sweet, spicy, satisfying deliciousness that will keep your hand (mostly) out of the cookie jar. So on that note, Happy, Healthy New Year to you! And I’m thinking if I spend an extra 15 minutes on the treadmill I’m going to be totally fine with scanning some bacon into my phone. Place all ingredients except tea bags into a large pot and bring to a boil. Stir until juice melts and remove from heat. Add tea bags and brew for 5 minutes. Discard bags and pour the tea through a fine mesh strainer to remove the solids. Enjoy! Whoa those bracelets sound awesome! 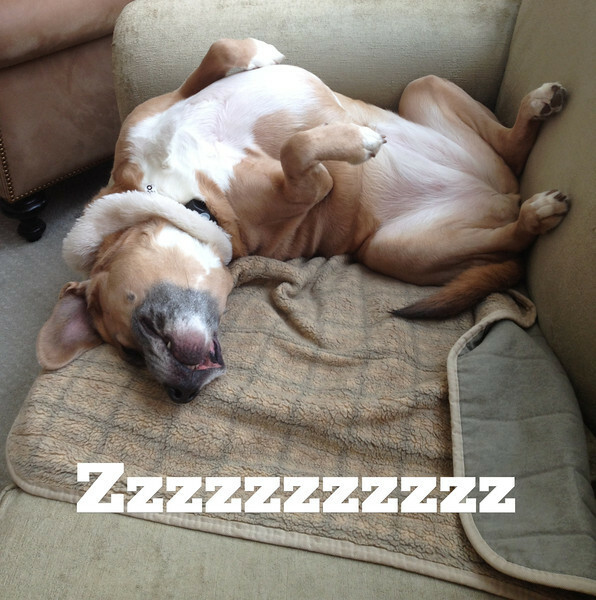 I’d love to know how many steps I take in a day…and what my sleep cycles are like! I need some more healthy ways to satisfy my seemingly never satisfied sweet tooth and this tea sounds perfect for taking the edge off. Since we don’t have a car here in Buenos Aires and we live 2 blocks from miles of beautiful parks , we usually walk just about everywhere here. And I think my heart and the rest of me appreciate the exercise. Wishing you a Healthy & Happy New Year ! I’m trying hard to get my walking up – the dog is having a grand old time with it! And if you are moving to NYC you’ll get all the walking you need – it’s that kind of city. :) Happy New Year! Very interesting post about the bracelets, sadly , I don’t have an iPhone. Re the tea, we don’t have the apple juice concentrate here so how cups of apple juice would I need to use? What does it say on the side of the concentrate can? You would need 6 cups of juice to to equal the concentrate, but then I would take the water down by a couple of cups so you don’t have too much liquid. And I think the UP band is coming to Android soon! out for the Android version myself. I have never heard of those bracelets. How fun! I am not technie enough I think to do that. I do need to excercise as I am always sitting at work then 4 hrs commuting, then my hobby as a crafter..Oh boy. My hubby walks miles a day at the office. So funny how we are opposites. I can’t wait to try this recipe. I love tea!! I like flavored teas, but I’d never thought about heating juice to steep the tea. What a great idea. Those bracelets sound awesome. I too am iPhone-less, but will wait for the next version.